Dentistry has become so exciting and challenging since predictability has been recognised for long-term dental implant and restoration success (Adell et al, 1981, Cox and Zarb, 1987, Albrektsson et al, 1981). As the number of patients selecting dental implants as a treatment option continues to grow, the dental team must accept the challenges of maintaining these sometimes complex restorations. The value of using conventional periodontal parameters to determine peri-implant health is not clearly evident in the literature (Orton et al, 1989). Therefore, it is paramount that the dental implant team understands the similarities and distinctions between the dental implant and the natural tooth. Subsequently, by examining the similarities and differences between a natural tooth and a dental implant, basic guidelines can be provided for maintaining the long-term health of the dental implant. Direct anchorage of alveolar bone to a dental implant body provides a foundation to support a prosthesis and transmits occlusal forces to the alveolar bone. This is the definition of osseointegration (Rateischak and Wolf, 1995). 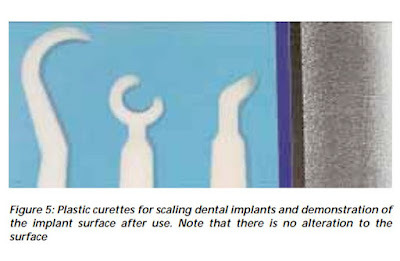 With the increased acceptance of dental implants as a viable treatment option for the restoration of a partially edentulous or edentulous mouth, the dental team is faced with maintaining and educating those patients.